Wild Postings, Hotspots, Wallscapes, Which Format is Right for You? Billboard advertising has advanced greatly over the years. The industry is no longer using expensive and unreliable methods of collecting data like counting tools, but has evolved into the modern age alongside methods like pay-per-click and social media. We have the same access to the granular audience data. This creates the ability to apply audience counts against the same targeting segments as other digital advertising platforms. Using this specific data along with an understanding of the brand, message, and buyer’s journey, a wise advertiser can see a perfect opportunity for an “in-real-life” exposure. And further, with this data, we can determine what format of advertisement will be best. Here’s a breakdown of the difference between Wild Postings, HotSpots, and Wallscapes. HotSpots are the culmination of all the data that’s available to us today. This format’s strongsuit is the ability to target hyper-local. In fact, we have HotSpot consultants on staff that will work with you on your strategy in order to pick the perfect location in Chicago. The right geographic area is all about hitting the right audience. And with our deep roots in the Chicago market we’re able to save you money and advertise where your audience is. This type of pinpoint targeting can allow for some pretty creative campaigns. We’ve worked with local restaurants, plumbers, and real estate teams to find the perfect edge in their market along with big brand like Adidas to pick the perfect neighborhood demographic around their new, flagship store. Check out some of these examples here. If your campaign can be paired with a social media campaign, directed towards millennials, or both, we might direct you towards Wild Postings. 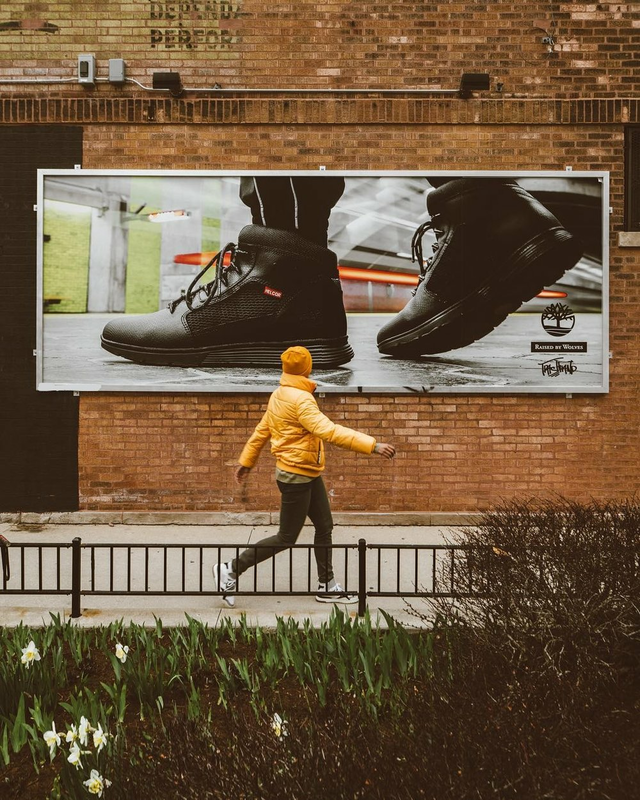 Wild Postings are street-level advertising signs (posters) utilized in dense & urban parts of Chicago with high pedestrian traffic. There are many reasons why Wild Postings might be for you! Your campaign strategy might be able to utilize the unique ability of Wild Postings to be set perfectly eye-level with commuters and residents making it the perfect medium for being noticed. Because of this, it pairs nicely with social media campaigns by utilizing interaction with an ad you can take a picture in front of or literally reach out and touch. If you want to go big and bold, you use Wallscapes. That’s why you often see big brands using wallscapes. First off, Wallscapes are fixed directly to the surface of a building (or sometimes painted on) which makes this immediately different from other outdoor advertising formats. But this gives it the unique opportunity to not be one of a few standard sizes and come in many different shapes and sizes, along with the ability to be much, much larger. So, if you are trying to make a big statement, grow the perception of your brand, and really get someone's attention, this is a great option for your advertising portfolio. All of these formats are unique in their own way. Our first step is to take a look at your strategy and determine which format will fit it best. Then we work with you to craft the perfect messaging and design to fit your strategy and format choices. Contact us today to work with an expert in determining the perfect OOH strategy for your business!